Please note that this post was created in partnership with Sea to Table months prior to them being reported of fraud and labor abuse in the industry. I do not support nor condone any company who preys on consumers’ that want to do good by promoting false transparency and sustainability. When this sort of thing happens, it harms the entire movement; it negatively impacts the companies who are actually being transparent and providing sustainable options because they’re painted with the same brush. This is a very unfortunate situation, but please know that there are brands out there you CAN still trust. We all love takeout—especially Chinese takeout. It’s fabulous to curl up with on a rainy night and it’s the perfect thing to dig into upon arriving home after a long week that’s left you exhausted and unwilling to cook. But I think we can all agree that it’s a treat. It’s a sometimes thing. 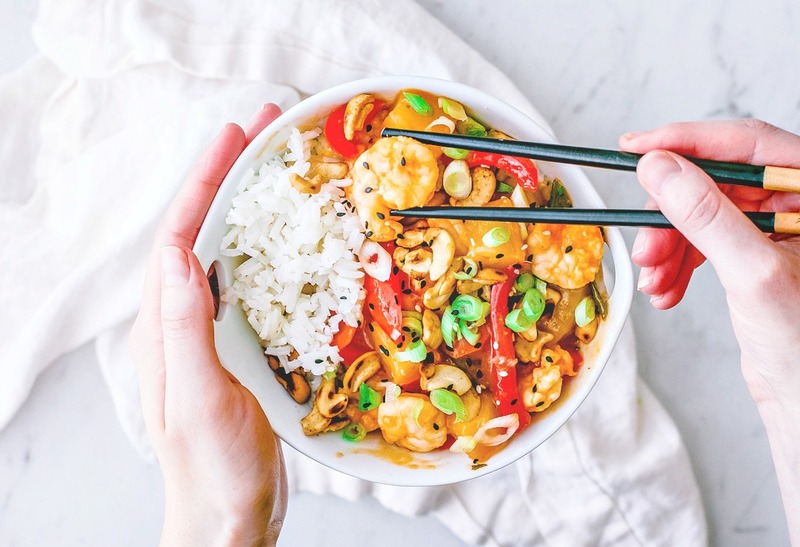 That just isn’t necessary, and this Healthy Sweet and Sour Shrimp tossed with crunchy veggies and toasted cashews is lip-smackin’ proof. Pass on refined sugar. Honey and maple syrup are my go-to’s when it comes to substituting sugar. In this recipe, I went for honey since honey tends to be paired with many East and Southeast Asian-influenced flavors anyway—natural fit! You could also use unrefined sugars, like coconut sugar or sucanat. Real pineapple matters. A lot of sweet and sour recipes call for canned pineapple. I have nothing against canned goods, but there have been times when I’ve purchased canned pineapple only to find white, flavorless chunks of fruit sitting in watered down juice, and that adds nothing to a dish like this. Grab yourself some legit pineapple and a bottle of pineapple juice, and you’re set. Shrimp! America’s favorite seafood. Even those (savages) that have an aversion to seafood admit shrimp is an exception. Sadly, as a result, shrimp is one of the least sustainable seafood options out there. But this doesn’t mean you have to stop eating it. It’s all about finding a trusting source. If you make this dish, snap a photo and tag me on the Insta @killing__thyme! I love seeing your creations. Want to share your own pescetarian recipes, photos, and experiences? Join our Facebook group! This 30-minute Healthy Sweet and Sour Shrimp is tossed with crunchy bell peppers, carrots, sweet pineapples, scallions, and toasted cashews for a wholesome weeknight meal. 1 red bell pepper, cored and sliced into thin wedges you can also cube the peppers, it's all in your own preference. Pat your shrimp, then dry and season with salt and pepper; set aside. Whisk all of the ingredients for the sauce together until well blended; set aside. Heat oil in a large saucepan or wok over medium heat. Add the garlic and ginger, and simmer until aromatic—about 1-2 minutes. Don't brown the garlic. Add the bell pepper, carrots, and scallions. Sauté until tender—about 2-3 minutes. Add the pineapple chunks and the sweet and sour sauce. Let it simmer for a few minutes as the sauce thickens a bit. If you want a thicker sauce (I always do), mix 1/4 cup of cold water with 1 TBSP of corn starch in a small bowl. Mix until corn starch is completely dissolved, and slowly add it to the simmering liquid, stirring constantly, until the sauce reaches your desired consistency. Bring the heat to medium-low. Add the shrimp and toss to coat. Shrimp cooks quickly, so you'll only need to let it simmer for about 2 minutes until it's cooked through. Once the shrimp is opaque, it's ready. Don't overcook, or the shrimp will be rubbery. Remove from heat and toss in the toasted cashews (see notes for toasting instructions). Serve over rice or quinoa, and garnish with scallions and sesame seeds. To toast cashews, heat a dry saucepan over medium-low heat. Add the cashews to the pan and give it a shake. Standby to ensure the cashews don't burn. Shake and stir them every 15-20 seconds. Once they're golden brown, remove from heat. This should only take a few minutes. Never leave them unattended. Please note: If you end up using shrimp you have to peel and clean yourself, prep time may be longer. Loved this recipe and the great healthy alternatives. It’s great to be reminded of a healthier more natural pantry/fresh item. We like spice, so added a touch more chili sauce. We also included onion and snow peas for some extra veggies and nice texture. Wanted to use broccoli, but too much can ruin a good thing! This was a wonderful recipe! Will totally use this again. Hi Kim! I'm so so glad you enjoyed this recipe. Thanks for taking the time to stop by and leave feedback. I haven't made this in a while and I think that needs to change! Love your addition of snow peas. Such a beautiful crunch! This looks really good! Just wanted to let you know I FINALLY got the post about Pescetarian websites posted! I was hoping for 10, but was only able to find 10!! You are first on the list! Thanks for the inspo! Ummm. . . .only able to find 7. Duh! I love this! I am going to try this recipe at the weekend and let you know what I think... Thank you for sharing!! I do enjoy a good fakeaway - healthier and cheaper than buying in. Those shrimp look amazing too - it is so important to have a good seafood supplier. Great chopsticks technique - I am HOPELESS at using them! Ohh I love a good homemade Chinese recipe as welll! My family isn’t big on the cuisine so I only get it if I make it for myself and then freeze the remainder. Have you tried freezing this before? Easy and vibrant dishes like this are my favorite! I need to add this to my menu this week. Sounds perfectly delicious! Whut indeed. I can't believe what passes for home-cooked Chinese food in a lot of situations. I mean, I fully recognize the difference between Chinese home-cooking and takeout copycat, but still - too many store-bought sauce, which means too much sugar and salt. Sweet and sour sauces are usually so bad that I think a lot of people have never had anything even close to a Chinese-style version. So I'm definitely on-board with keeping the ingredients simple and transparent. As always, love to see you championing sustainable seafood. Keep up the good work! I love your healthier tips! My husband and I are currently on a cleanse and we can't have refined sugars. I am definitely going to have to make my own ketchup and make this dish this week! It's perfect too, since we love shrimp! I love the sound of this healthy sweet and sour shrimp. It sounds so much better than takeout. My Chinese food loving family will really enjoy this! I love everything in that bowl, especially the use of fresh pineapple, I find that canned pineapple tastes somewhat of the can! I didn't know this brand Sea to Table, I will look for it at my supermarket and make your recipe, everybody will love it in my family. Well I am one of those people that really doesn't like takeout. In fact in a whole year we might have take out 6 times!! I much prefer to make wonderful dishes like this at home. I totally agree controlling what goes into the dish is so important. This great recipe is the perfect example why making it at home is better. I love Sea to Table's shrimp!! It's absolutely delicious, and I feel great about ordering it. I love those traceability labels they use! We absolutely love Chinese food, but never eat it anymore because its never gluten free. This recipe is gluten free with Tamari and I appreciate that. I love that you found a sea food delivery company with sustainable seafood, that's amazing! One of my biggest issues with sea food is finding real wild caught shrimp and fish. I am absolutely putting this on our family meal plan. It has all of our favorites, pineapple, cashews, scallions... just perfect! My favorite part of the post, other than the delicious recipe and gorgeous photos, was the part about the 'savages' that don't like seafood. Hehe. Seafood is my favorite so I am not a savage! :) I also like that you talked about using natural sweeteners. I do that too. I've never heard of that seafood brand but I'm going to look into it! Great recipe and I can't wait to try it, especially that it's healthier than the usual sweet and sour! This looks so tasty! I love it - also I love your style of photography. Very clean and fresh. What a gorgeous looking recipe! Loving the look of that shrimp too - I'll have to see if I can find some near me! Thanks, Elizabeth! Sea to Table ships to your front door, so check them out! If it tickles your fancy, use my coupon code at checkout to get yourself $5 off! (Code: KILLINGTHYME) I don't get commission, just happy to provide readers with some perks. Especially when it comes to sustainable seafood! I love anything sweet and sour together. Shrimp works a treat in a sweet and sour sauce. I agree with real pineapple is totally so different. I can never eat the canned pineapple and I have nothing against canned fruit .. Love the color of this sauce. Thanks, Veena! I'm with you. I don't know what it is about the can, but it robs the pineapple of its bold flavor. I love shrimps in any form, but this dish looks absolutely delicious and perfect as a quick dinner. I can't wait to try it! This looks like such a tasty homemade version of a takeout classic. And healthier too! Yes! Real pineapple makes such a huge difference! Fresh ingredients are the best starting point for most dishes!! Fresh pineapple definitely makes a difference, especially in a dish like this. I could eat this every single night! Loving the flavors and nutritious ingredient list. Dana, real pineapple TOTALLY matters. And I'm SO in love with shrimp and more "sweet" and "sour" flavours lately. Maybe because of my upcoming trip to Asia! I love love love these shrimp and that they're sustainable. This goes on the list for dinner this week, fo sho. #RealPineapplesMatter. Let's get that trending. Keep me posted if you try this out! I wish I had that bowl in front of me right now! What flavors, and textures (and why-not, colors! ), Dana! Agreed on everything, especially the use of fresh pineapple.